Casa Caleta is located only meters from the sparkling sands of Puerto Vallartas most beautiful beach, making it an unique estate. Sandy Beachfront, Lower Conchas Chinas, Puerto Vallarta, Jalisco Casa Caleta is a private, beachfront Mediterranean Villa located in a secured, private enclave together with 2 other fully-detached, architecturally designed private homes. 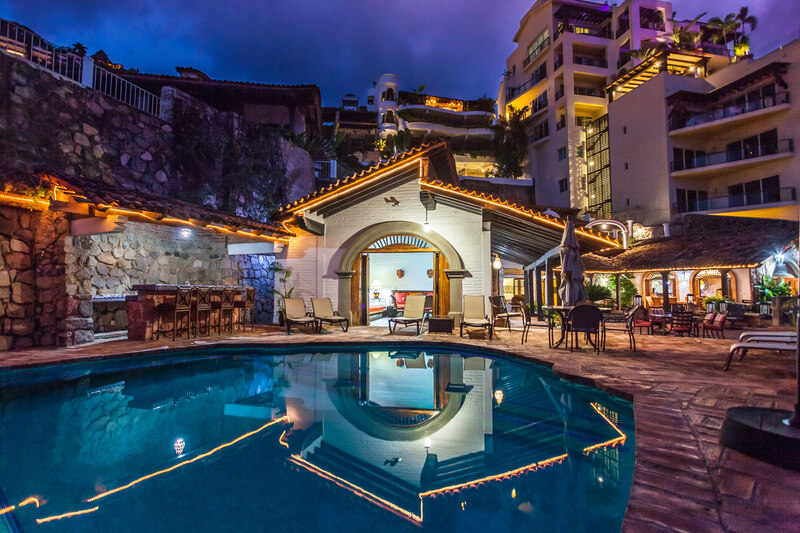 Set in the classically charming neighborhood of Lower Conchas Chinas, Casa Caleta is about a half-mile hike along the beach to the Los Muertos Beach and Zona Romantica areas. Attention to detail is the hallmark of this Villa from its gourmet chef’s kitchens (indoor and out-door), solid-slab marble flooring through-out, central air-conditioning systems, high-speed wireless internet, purified water system, plush pillow-top mattresses, top-of-the-line linens and bath accessories, flat screen TV’s throughout the Villa, sound system indoors and out, and much, much more. As you enter off the quaint narrow cobble-stoned street of Calle Sagitario through the solid wood and iron remote-controlled entry gates to the private parking court, you find yourself surrounded by a beautifully landscaped garden area with the tropical foliage high overhead. Entering Casa Caleta through its 4-inch-thick wooden double doors you are then in the intimate entry courtyard that provides access to the Residence through a paned, beveled glass entry-door. Then it hits you - the phenomenal ocean-view almost takes your breath away looking right through the Villa! The infinity pool actually seems as if it is truly part of the Bay of Banderas itself. From this point on you know that you have found one of the best-kept secrets in the entire Bay of Banderas. Whether it’s a long-weekend getaway or a several week family re-union, you can be sure that your entire stay at Casa Caleta will be thoughtfully planned to make you want to return again and again. While Casa Caleta will provide you with the privacy, intimacy and understated elegance you have been looking for. With its all-suite bedroom configurations, beautiful furnishings and full electronics, including a separate media-room – our highly-trained staff will pamper you unobtrusively.